Beginning at “Start!”, each player rolls the die and moves along the game board as indicated. The player takes a story element card each time s/he lands on one, but only one Setting card. Play continues until all players have completed the board path and reached the ending or “Write!” By this time, each player must have at least 5 description cards; if not, s/he chooses from the deck until 5 have been taken. The writers take an Outline Sheet and fill in each section of the Outline from the element card information – Topic Sentence, Plot, Setting, Characters, Resolution, etc. There are a number of potentially conflicting elements, so the writer must choose the element most useful to the rest of the information. Therefore, the writing actually begins in the making of these choices, which ultimately provides a solid foundation in the writing process and making a habit of it. Once the Outline Sheets are completed, the writers begin to write their stories, filling in the necessary details from the Outlines. This process typically requires assistance and guidance from an adult – parent or teacher – as it is the true imaginative work . . . developing interesting story details from the element cards that have been collected randomly. The guiding adult will score the finished stories and then has the opportunity to review the story with each writer, discussing areas where more work will be helpful and how to make it so. The fact that the game can be played with teams makes it valuable in practicing team work and group brainstorming, also. Many writers of various forms use “Storyboards” to outline their stories. 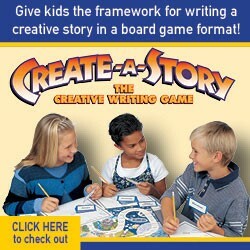 Create-a-Story provides insight into a similar process for young writers that can serve them throughout their lives. If, as an adult, one such student is someday required to present a lengthy speech, the habits of outlining and then filling in details, using colorful descriptions, having the presentation follow a logical flow . . . all of the skills developed while playing this fascinating game, will serve him/her well. Even attorneys who can present the facts of their case in a logical, clear, unfolding “storyline” will find success in their communications. The final utilitarian value of learning creative writing in this way is for the SAT essay section and other applications. Years of practice forming one’s thoughts into clear form and then putting them on paper will make such test-taking a breeze. Create Press offers an Online Teachers Manual, another writing game and other excellent materials to help each child become comfortable with creative writing. J.G.